Nellie began to “receive public speaking invitations from civic and business groups and I saw it as an opportunity to give witness to my Catholic faith.” She found that the more she talked about faith – “the more enthusiastic the audience response”. It was in 2005, when she encouraged four of her sons to start a tiling business, that Nellie also started a new venture. Using a PC tablet, which is computerized, she began by making print translations of some of her sculpted plaque and ornament designs but soon turned to using this technology to paint. Her first painting was of Blessed Kateri Tekakwitha. Nellie explains that soon after: ” I sensed I should paint an unborn child…I couldn’t think what sort of composition this would be, so I prayed for guidance. 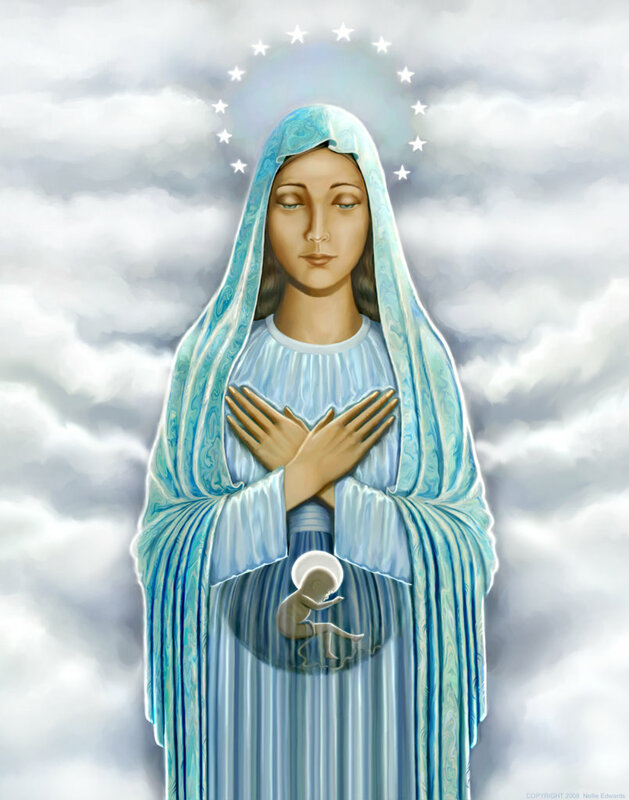 After about 2 weeks, I realized the unborn child would be Our Lord Jesus, in the womb of His Blessed Mother. I was afraid to attempt this but again, I could not get away from the idea. As with Kateri, I had no drawing to go by, nor visual aid…I simply started with the face of Mary and the composition seemed to develop almost organically. It was almost like watching someone else work.” The painting took nine months to complete. Because of limited space I have only been able to summarize a small part of Nellie’s story. If you would be interested in contacting Nellie Edwards, or to view and perhaps purchase prints of her beautiful paintings click here.